Alisa Weilerstein marks her Decca Classics debut with searing recordings of Cello Concertos by Edward Elgar and Elliott Carter.
. . . her style is as expressive and intense as ever . . .
Their interpretation is one of poise, heft and ardor, the soloist's superb control keenly matched by the conductor's insightful support . . . Ms. Weilerstein's account persuades with its lyrical urgency and regal command . . . Ms. Weilerstein asserts her own identity while also taking advantage of Mr. Barenboim's affinity for Mr. Carter's idiom. Again alertly accompanied, Ms. Weilerstein savors Mr. Carter's mercurial shifts and puckish gestures. Wisely, she invests the more ruminative passages of Mr. Carter's eruptive work with the same luxuriant expressiveness that enriches her Elgar, to compelling effect.
. . . Weilerstein's charisma and passionate playing make it the album's main attraction . . . [Carter]: it deserves its place on the program for its seriousness and extraordinary displays of solo and orchestral writing . . . [Bruch's "Kol Nidrei"] returns the program to a mellow and melancholy mood and brings the CD to a satisfying close. Decca's reproduction is excellent, putting Weilerstein front and center with full resonance, but not leaving the vibrant accompaniment of the orchestra too far behind her. American cellist Alisa Weilerstein has been attracting intense heat over the last few years . . . Barenboim is undoubtedly one of a few superstar conductors in the world today, but there's more meaning to the conductor's presence here than meets the eye . . . Weilerstein imbues every phrase of the Elgar with plush, dark beauty. She takes her lyricism seriously and endows even the jocular bits, like the skittish quick descents at the beginning of the fourth movement, with a fierce and even slightly hard edge. Weilerstein's version is full of passion . . . Although the Elgar is the big, mainstream attraction of this recording -- and as rich and expressive as her performance is -- I'll be returning to this album at least as often for Carter's Cello Concerto . . . the juxtaposition of the Elgar and the Carter proves particularly illuminating . . . This is an album that is sure to garner Weilerstein even more acclaim . . .
. . . a powerful performance . . . an extraordinary emotional intensity . . . sometimes the line is as much about the singing as the song, but what passionate singing it is. The Elgar Concerto has a new champion in Cleveland native Alisa Weilerstein. Her performance here with conductor Daniel Barenboim and the Staatskapelle Berlin not only bears comparison to Jacqueline Du Pre's but also stands out markedly for its depth, virtuosity and animation. Further proving her mettle is the Cello Concerto of Elliott Carter, a bracing, austere work Weilerstein manages to humanize. Rounding out the disc is a predictably engrossing account of Bruch's "Kol Nidrei."
. . . a performance for the ages . . . [Carter: Cello Concerto]: [Alisa Weilerstein] plays brilliantly and the close sound doesn't miss a note. Despite its challenges, Carter¿s sheer joy and love of music shines through this amazing work. Anyone curious about significant music being written in our time will not be disappointed . . . [Elgar: Cello Concerto]: Especially notable is Weilerstein's brilliant cadenzas in the second movement. In the emotional center of the work, the Adagio, she performs with Mahleresque intensity -- simply marvellous. She romps through the finale with earnestness and heartfelt purpose, and Barenboim adds his own expressive touches. This is playing of incredible vulnerability and sadness, devastating at times, yet passionately resplendent. Bruch's "Kol Nidrei", a rhapsodic and prayerful work celebrating Yom Kippur, is much more than a bonus. Weilerstein invests her soul in a performance that reaches beyond reverent, to the sublime . . . this is a great recording to be treasured. Don't miss it! Cellist Alisa Weilerstein . . . displays astonishing communicative skill and technical facility as she performs a piece of music with a formidable legacy . . . Weilerstein succeeds on her own terms on her Decca debut. She creates a heartrending interpretation as the deep-toned beauty of her sound takes on mournful melodies, howls and whimpers. Barenboim guides a characteristically sensitive and full-bodied performance, with the orchestra and soloist in perfect accord. Weilerstein opens a rhapsodic third movement with a poignant questioning quality as her strong sound dissolves into a wisp, and she boldly conquers the vivacious finale in which explosive virtuosity alternates with singing lyricism. Elliott Carter's mercurial concerto contrasts the emotive Elgar with crashing, dissonant orchestral interjections constantly breaking into Weilerstein's searching line. An affecting rendition of Max Bruch's "Kol Nidrei" concludes the recording.
. . . [Weilerstein] relishes the composer's bristling passagework and insistent personal voice . . . Weilerstein and Barenboim's generously expressive alternative makes this craggy and mysteriously compelling piece seem vulnerably human . . . Fiercely committed performances . . .
Alisa Weilerstein creates a poignant interpretation of Elgar's iconic concerto. The deep-toned beauty of her sound and sensitive phrasing honor the work's mournful melodies. Her finely tuned dynamic sense serves her well, from a throaty, vibrato-laden wail to plangent, vulnerable whispers in her upper range. Attentively led by Barenboim, the orchestra builds to a feeling of overflow and then gently embraces the soloist. Resignation gives way to thrilling vigor in the hot-blooded, virtuosic finale. She plays Carter's mercurial concerto with equal command.
. . . a formidable performance of Elgar's Cello Concerto, as searching emotionally as it is technically flawless. The 30-year-old's tone, not too fat, not too sweet, is ideal for Elgar's autumnal masterpiece . . . Weilerstein is greatly helped here by Daniel Barenboim . . . [who] offers magisterial support with his excellent Berlin Staatskapelle. This performance demands to be heard by any Elgarian, and for me, takes its place at or near the top of the list. Weilerstein also draws out all the sombre poignancy of Max Bruch's "Kol Nidrei". There could never, ever be another version of the Elgar concerto to match Jackie's, could there? Jacqueline du Pré's 1965 recording with John Barbirolli was her greatest legacy, spoiling the field for all successors. But if you listen to Weilerstein's performance, conducted by Daniel Barenboim (Du Pré's ex-husband and musical soulmate), it is hard to avoid the impression that the spirit of Jackie lives on . . . [the reading] has warmth, temperament, lyrical intensity: Weilerstein makes the Adagio really sing, without lapsing into sentimentality. The Berlin Staatskapelle's accompaniment breathes nobility and spirit, and the coupling is inspired . . . [Carter]: Weilerstein is a charismatic advocate, and rounds off the disc with a moving rendition of Bruch's Kol Nidrei.
. . . within the first seconds, we know that Weilerstein speaks with her own voice. The muscular bowing, the sound's depth and warmth in the opening bars: you couldn't ask for a more characterful beginning. And no disappointment lies ahead as she communes with the music's melancholy, never letting intensity of feeling or sentimentality pull apart the cello's soaring lines. She's equally distinctive at high speed, dancing through the second movement's skittish rhythms with gusto. Barenboim's orchestra, meanwhile, offers tautly articulated woodwinds and a fiery intensity perfectly pitched to Weilerstein's own flames. This is an extremely exciting and rewarding account . . . [Carter]: with Weilerstein giving her heart and soul to Carter's constantly evolving filigree line we're always aware of the concerto's singing voice. The singing grows yet more ardent in . . . Bruch's "Kol Nidrei", its central melodies shaped and coloured by orchestra and soloist with a lovely dark lustre. Intelligent programming this, leaving the listener safely cradled in tonality's arms -- although Weilerstein could probably make sweet music out of anything. She grasps the Elgar from the opening of the Adagio Moderato and stamps her character upon it. The Carter, meanwhile, offers a showcase in how to deal with the orchestra's sudden astringent tone-clusters and exclamatory percussion without ceding command: the progress from the Tranquillo to the Allegro fantastico is, well, fantastico.
. . . a superb showcase for the talents of a gifted soloist . . . Weilerstein avoids nostalgia and produces instead an account that is full of passion, grief and nobility of feeling . . . an authority and poetry that demands our attention from the outset, and the eloquence of her playing ensures that she holds it throughout. The way that she and Barenboim negotiate tricky moments [seems perfect] . . . Weilerstein brings a sense of dark, almost ironical triumph to the finale. It's a highly intelligent reading, without any compromising the emotional dimensions of the work . . . [Carter]: It's clear that this music holds no terrors for Weilerstein . . . she always gives the ideas time to breathe. Her interpretation, at once remarkably expressive and a continuous display of headlong, high-pressure virtuosity, seems to me to outrank the existing recorded versions . . . A meditative account of Bruch's "Kol Nidrei" -- Weilerstein here expounding the melody in its full innate dignity, without an ounce of excess sentiment -- closes a thoughfully-constructed and thought-provoking programme. The young American cellist Alisa Weilerstein has been called the new du Pre and I can see why . . . [the recording is] remarkably impressive . . . [Elgar]: The changing moods of the scherzo are perfectly caught; the Adagio is effective . . . the last Lento in the finale makes an emotional climax . . . [Carter]: Weilerstein . . . brings the same immaculate tonal control to bear . . . [Bruch's] "Kol Nidrei" is a fine vehicle for Weilerstein's gorgeous tone. Her developing band of fans will devour this CD. To hear an orchestra with such a distinctive central European sound playing Elgar, and relating his music so securely to the wider late-romantic tradition, is one of the disc's great pleasures. Weilerstein's approach is impressively bold and big-boned . . . [Carter]: Weilerstein characterises its sequence of linked movement types wonderfully . . . her richly expressive tone -- and the fabulous refinement of the Staatskapelle strings -- are heard to best advantage in Bruch's adagio. This powerful, emotionally captivating interpretation of the Elgar concerto is a testament to the sensibility and tellingly calibrated artistry of the American cellist Alisa Weilerstein and to Barenboim's profound musical perceptiveness. He brings expressive breadth and refreshed detail to this performance. The serene lyricism in Bruch's "Kol Nidrei" is voiced with poise, and Elliott Carter's Concert . . . asserts his eternal vitality. This is a precious disc, and certainly not in the pejorative sense. Weilerstein plays with robust vigour, but a heart-stopping moulding of phrase. She brings to the Elgar concerto . . . a portamento beautifully judged and asserted in a brand-new, old-fashioned way (no contradiction!). The work's great formal turning points are invested with a sometimes almost ominous suspense. A profoundly captivating, atmospheric account . . .
. . . something of a global sensation. She's drawn comparisons to Jacqueline du Pré and who can wonder at it? Beautiful music, beautifully performed . . .
. . . a remarkable, once-in-a-blue-moon album. The recording, like the 30-year-old American cellist, is supercharged with virtues that speak to the better part of human nature. Weilerstein's take on two concertos . . . instant five-star favour with reviewers . . . Weilerstein's Elgar recording shares the impassioned spirit of its famous predecessor [du Pré]. And yet its intense lyricism and natural flow stand alone, exceptional qualities that will endure no matter how many times you press Play.
. . . her performance zings with freshness and energy. Weilerstein pairs it with Elliot Carter's knotty Cello Concerto and brings the same intensity to a difficult piece. Weilerstein opens the Elgar boldly and defiantly . . . There are dynamic subtleties . . . sometimes subito, and intimacies but the scherzo-like second movement goes like the wind, and [is] brilliantly brought off . . . The finale's strides are brought off with purpose and passion . . . The closing stages of the concerto find Weilerstein at her most affecting . . . this release is made indispensible for the marvellous account of Elliott Carter's equally amazing Cello Concerto . . . Over the Concerto's seven-movement, 22-minute course, the music is typically quixotic yet rigorously laid out . . . [Weilerstein] gives a totally convincing and committed interpretation, fearless, the music's depths and contrasts fully revealed, the ear beguiled by many conflicts, complements and mood-swings, and an ever-changing and dazzling orchestration. It's a completely compelling work here given a great outing . . . [Bruch: "Kol Nidrei"]: the reading is completely identified with the music's soulful measures . . .
A really quality offering. The finest Elgar album of 2013. Tonally burnished, technically startling and ripely emotional -- it's been years since a new recording of Elgar's great concerto made this kind of visceral impact. Conductor Daniel Barenboim accompanies Weilerstein's playing superbly . . . This is a magnificent concerto debut . . .
. . . [a] sensational disc . . . [a] wonderful recording . . . Daniel Barenboim has helped cellist Alisa Weilerstein craft a version of the Elgar Concerto that is at once tender and noble, but steely, determined and fiery, too . . . As superbly performed as it is imaginitively programmed, Alisa Weilerstein's recording of Elgar's and Elliott Carter's Cello Concertos brings together the flare of one of today's most inspiring young cellists with the insight of Daniel Barenboim, a conductor famously closely associated with Elgar's work . . . This brilliant concerto coupling is surely a must for any collection . . . The end-result of the Weilerstein-Barenboim collaboration is a recording of the Elgar already being hailed as one of the greatest ever made of the concerto . . . The Carter Concerto too has made a major impression . . . Incredibly, the disc was the cellist's first concerto recording, the Elgar taped while she was still in her twenties . . . The end-result of the Weilerstein-Barenboim collaboration is a recording of the Elgar already being hailed as one of the greatest ever made of the concerto . . . The Carter Concerto too has made a major impression . . . Incredibly, the disc was the cellist's first concerto recording, the Elgar taped while she was still in her twenties . . .
. . . Barenboim and his Staatskapelle Berlin's fiery, late-romantic contribution played a key part in the success of Alisa Weilerstein's compelling interpretation of the concerto . . . In the Elgar, Weilerstein has an Anglophile's insight, sensing Elgar's "nobilmente" in the adagio, the work's emotional core. In the opening cantilena, her cello sings its heart out in the work's most sublime moment. She spirals the cello up the chromatic scale to its highest E, melting into the orchestra's fortissimo chord like a divine embrace. In Bruch's "Kol Nidrei", the cello sweeps through the Aramaic Jewish prayer . . . This entire Elgar CD is one of my year's most fulfilling listens.
. . . a sensational album.
. . . [Elgar]: Her tone is strong and true, with little fuzz, her phrases are rich in lights and shades, and her musical line goes on forever, particularly important in the first movement . 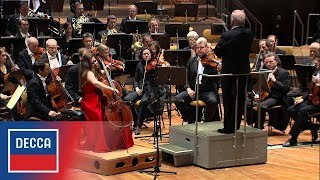 . . [Bruch / "Kol Nidrei"]: Weilerstein and Barenboim give a fine performance . . .
Wer die im Konzert sichtlich schuftende, geräuschlüstern schnaufende und auftrumpfende Weilerstein erlebt hat, realisiert die Ernsthaftigkeit dieses Talents. Sie schürft und schlürft die Töne wie aus granitener Quelle . . . Das Mädchen muss ein Wundertier sein. Weilerstein lässt ihr Instrument tatsächlich singen, indem sie alle Töne ganz dicht miteinander verbindet. So erzeugt sie eine große Intensität . . . [Barenboim] entfaltet gemeinsam mit ihr und der Staatskapelle Berlin einen gewaltigen Sog. Zum Beispiel, wenn Orchester und Solistin das Tempo kurz vor dem Höhepunkt ein kleines bisschen verzögern, um die Spannung zu steigern. Da wirkt der Eintritt des Themas wie eine Erlösung . . . Ihre Interpretation ist von starken Emotionen beseelt. Das gilt für die großen Gesten ebenso wie für die intimen Momente . . . [Carter]: Weilerstein hat auch diese Partie souverän im Griff. Mit dem letzten Stück, Max Bruchs "Kol Nidrei", kehrt sie wieder zur Spätromantik zurück -- und lässt noch einmal ihren wunderbar warmen Ton aufschimmern. Dass die junge Cellistin schon jetzt zu den Großen ihres Fachs gehört, stellt sie mit der Aufnahme eindrucksvoll unter Beweis. Ihre Ausstrahlung: sinnlich. Ihr Spiel: hingebungsvoll. Der US-Cellistin Alisa Weilerstein steht eine große Karriere bevor. Weilerstein gestaltet melodische Bögen kraftvoll, dicht und intensiv, kann ihren warmen, sonor präsenten Ton aber auch subtil zurücknehmen, wo resignative oder nachdenklich entschwebende Passagen das erfordern. Obwohl dem erst 2001 komponierten Konzert von Carter romantische Emphase wesensfremd ist, profitiert das . . . Stück von Weilersteins zupackendem, expressivem Spiel. Jetzt kommt in Gestalt von Alisa Weilerstein eine kühne, dreißig Jahre alte Amerikanerin daher, die voller Leidenschaft und sprudelnder Energie steckt . . . Weilerstein hat sich das Werk so konsequent und überzeugend anverwandelt, dass sie mit ihrer Aufnahme aus dem Schatten des Mythos [Jacqueline du Pré] heraustreten und ihre eigene, rhetorisch zugespitzte Lesart Elgars geben kann. Von den ersten Takten des eröffnenden Adagios an findet sie zu einem vibratoreich singenden, dunkel klagenden Ton . . . sie treibt, gemeinsam mit Barenboims ausgezeichneter Staatskapelle Berlin, den abschiedsschweren Charakter des ersten Satzes mit den hastenden Allegroteilen des zweiten in eine hochgespannte Dramatik, die nachgerade expressionistisch klingt. Das an Mahler erinnernde Adagio des dritten Satzes gerät auch ihr zum Herzstück des Werks: ein schwebender, sich melodisch verströmender innerer Monolog, dessen Ausdruck bei Weilerstein jedoch nun um einiges weltzugewandter, offener und nicht ganz so erinnerungstrunken wirkt wie in der Aufnahme mit Jacqueline du Pré. Mit welcher Emphase sich Alisa Weilerstein diesen späten Wurf Edward Elgars zu eigen gemacht hat, ist bemerkenswert . . . Mit ihrer ausgeprägten musikalischen Phantasie und ihrem farbigen, hochemotionalen Spiel bringt Alisa Weilerstein auch für die Charakterfülle von Elliott Carters Cello Concerto aus dem Jahr 2001 ideale Voraussetzungen mit -- eine kompositorische Hommage an die Ausdrucksmöglichkeiten des Cellos . . . Nicht zuletzt kommt ihr auch hier wiederum die Erfahrung Daniel Barenboims zugute, der mit Carters Musik aufs engste vertraut ist. Die sieben ineinander übergehenden Sätze des Konzerts mit ihren raschen Stimmungswechseln, ihrer rhythmischen Komplexität und ihren koboldhaften Umschwüngen entfalten im Dialog zwischen Solistin und der kammermusikalisch agierenden Staatskapelle eine mitreißende, beinahe szenisch anmutende Prägnanz.
. . . [Weilerstein spielt] melancholisch und mit Eleganz . . . [Elgar]: sie schwebt auf ihrem eigenen Weg durch das Konzert: Mit warmem Ton umarmt sie das Orchester zu Beginn, wenn sie das Thema des ersten Satzes über zwei Oktaven abwärts segelt. Nähmaschinenartig die Präzision und ihr Tempo, wenn sie im zweiten Satz die Noten umherflitzen lässt. Mit starken Effekten trumpft auch die Staatskapelle Berlin auf. Daniel Barenboim und die 31-jährige New Yorker Cellistin Alisa Weilerstein rangieren mit ihrer Interpretation des Elgar-Cello-Konzerts in der absoluten Luxusklasse. Höchste Perfektion der Solistin und der Staatskapelle Berlin paaren sich mit nie nachlassender Intensität und auf Hochglanz polierter Klangkultur. Ihr kantabler, runder und agil hellhöriger Ton verrät schöne Herkunft aus der Kammermusik . . . [Carter]: die tiefschürfende Weilerstein [ist die] ideale Besetzung für das 2001 in Chicago von Barenboim uraufgeführte Werk . . . eine hoch talentierte, dynamische Musikerin.
. . . ein sublimes Hörerlebnis, zugleich erhebend und bewegend, in den Adagio-Momenten nachgerade zum Niederknien. Als dächten Solistin, Dirigent und Orchestermusiker in stiller Liebe an die tragisch früh verstorbene Jacqueline du Pré . . . Womit sie zugleich den englischen Komponisten adeln, der mit diesem Werk unmittelbar nach dem Ersten Weltkrieg seinen Schaffensgipfel erreichte: fesselnd von den verhangenen nobilmente-Akkorden des Beginns bis zum "Falstaffian last movement". . . [Carter]: Das Orchester hält sich meist im Hintergrund, um das Charakterspektrum des Soloinstruments möglichst konturklar, geistreich und gewitzt herauszukehren -- mal schwärmerisch, mal gauklerisch, mal kantig, mal verhuscht. Bedenkt man, dass Carter damals 93 Jahre alt war, kommt man aus dem Staunen nicht heraus . . . Ein würdiger Nachruf der Solistin, der Staatskapelle Berlin und ihres GMD auf den im Dezember 2012 verstorbenen Komponisten.
. . . son style est aussi expressif et intense que jamais . . .
. . . une interprétation parfaitement mûrie où Weilerstein donne au concerto une grandeur et une intensité qu'on n'a pas retrouvé dans d'autres enregistrements . . .